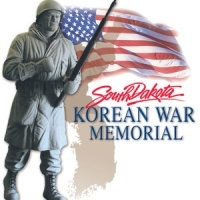 The memorial will be a lasting monument to more than 26,000 South Dakotans who were called to service in the Korean War and more than 170 who never returned from combat. These men and women will always be remembered for their bravery and dedication to South Dakota and to the United States. Order a Video of the Parade and Dedication at 1-800-456-0789 or 1-800-777-0789. Some 53 years ago, the Cold War exploded into conflict. By the end of the Korean War on July 27, 1953, some 6.8 million Americans had traveled to Asia for the war effort. 33,686 died and 103,284 were wounded. Watch a Web-cast of the Korea Survivor Stories Program VHS copies of the program are available for $19.95 plus $5 shipping and handling (shipping and handling waived for members of the Friends of SDPB). Although the Korean conflict ignited just 5 years after World War II, South Dakotans answered the call. An estimated 26,000 South Dakotans traveled far from home to fight and 170 of them died in that effort. The 1-hour program includes dramatic stories like those of a member of the 26th Infantry Scout Dog Platoon; a POW who spent 6 weeks in captivity; and a pilot who faced harrowing challenges during evacuations for the wounded. The program uses interviews, veterans’ photographs, archival footage of the war and background on the conflict to bring the stories to life. “Korea: Survivor Stories” includes interviews with veterans across the state, including those who attended the 50th Anniversary of the Korean War 2000-2003 Commemoration in Huron on July 27, 2003. In addition, SDPB crews traveled to Tyndall and Armour to interview those who served in Korea. For information on this and other SDPB programs, call 800-456-0766.